“Future Farmers of America” was founded by a group of young farmers back in 1928. Their mission was to prepare future generations for the challenges of feeding a growing population. They taught us that agriculture is more than planting and harvesting– it’s a science, it’s a business and it’s an art. Founded in 1928, the Future Farmers of America brought together students, teachers and agribusiness to solidify support for agricultural education. In Kansas City’s Baltimore Hotel, 33 young farmboys charted a course for the future. They could not have foreseen how the organization would grow and thrive. Since 1928, millions of agriculture students – no one knows exactly how many – have donned the official FFA jacket and championed the FFA creed. FFA has opened its doors and its arms to minorities and women, ensuring that all students can reap the benefits of agricultural education. Today, the National FFA Organization remains committed to the individual student, providing a path to achievement in premier leadership, personal growth and career success through agricultural education. Now, the organization is expanding the nation’s view of “traditional” agriculture and finding new ways to combine agriculture education, science, leadership and career skills that allow FFA members to well positioned for their future professions. Click for additional information about the National FFA Organization. 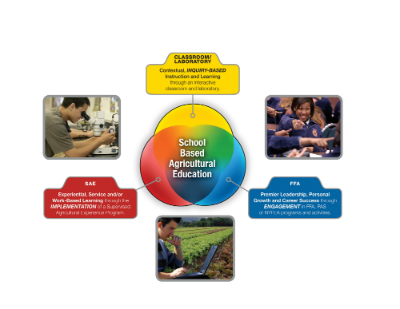 What Is School-Based Agricultural Education? School-based agricultural education (SBAE) is an essential educational program delivered through career and technical education in every state of the United States and in five U.S. Territories. There are approximately one million agricultural education students in the nation, in more than 7,500 schools who are taught by nearly 12,000 secondary, two-year postsecondary and adult instructors. Experiential, service and/or work-based learning through the implementation of a supervised agricultural experience program. The complete integration of these three components helps to ensure students’ career success or continuation with higher education related to agriculture, agriscience and/or agribusiness following high school graduation. The FFA (Future Farmers of America) organization is the training and testing area of agriculture education. FFA evaluates the skills that students learned through agriculture education by using Career Development Events. It also sharpens students’ speaking and leadership skills. Why Should I Join FFA? Do you know what you want to do after you finish high school? FFA can help you develop your skills and prepare you for that next step. If you’re uncertain, FFA can help you determine which of agriculture's 300 exciting career options match your personal interests and skills. If you're like the 73 percent of today’s FFA members who already plan to pursue a career in agriculture, you know that there are options for almost any interest, whether you want to work indoors or outside, at a desk on in the lab, in the city or on a farm and with other people or on your own. Even if you don't choose a career in agriculture, the skills and training you gain through FFA will lead to success in any industry. FFA can help you become a leader. Through FFA, members strengthen their personal sills, learn to manage their time and discover how to respect themselves and gain respect from others. Leadership skills are developed throughout the FFA program from a local FFA chapter's programs of activities; special local, state and national opportunities and experiences; state and national leadership conferences and workshops and career development events. FFA offers many opportunities for recognition at the local, state and national levels. You can even earn money for school through scholarships. Check out our programs and awards. How would you like to get paid for learning? Many FFA members start their own businesses or work for an agricultural company in high school. Some FFA members have earned hundreds of thousands of dollars by the time they graduate from college by reinvesting their profits in their business. FFA is an integral part agricultural education. To join FFA, you must be enrolled in an agriculture course at your school. Contact your school counselor or agriculture teacher to enroll in an agricultural education program and join FFA. In some instances, students who do not have an FFA chapter in their schools have been able to join FFA chapters in neighboring school districts. Whether you can join an FFA chapter in a neighboring school district is a state and local decision. Use the button below to search for an active chapter near you. Where is a Chapter Near me? This PPT provides a succinct 20 slide overview of who we are, how we started, and the value FFA bring to a school system and community. The PPT covers our three-component model and includes four videos that tell our story. The videos are what makes the ZIP file so large and must be re-linked to the PPT after downloaded.